Disappointingly, my family tree shows no signs of an Italian heritage. Quite surprising really, considering my obsession with this food culture so steeped in tradition. In Italy, food is not just about eating. It’s about gatherings, large or small, celebrating life and conviviality. A typical meal starts with the antipasti, which means ‘before the meal’ and not ‘before the pasta’ as people often think. The purpose is to stimulate the appetite rather than satisfy. This custom dates back to Ancient Roman times when a variety of light dishes where served before the feast. Modern day antipasti platters include cured meats, a variety of preserved vegetables, cheeses and of course, bread. 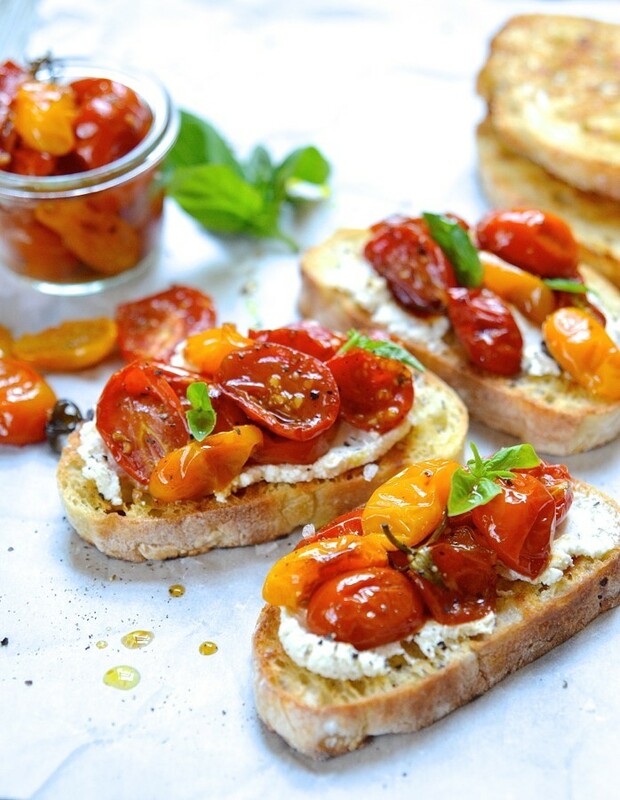 This tricolore Candied tomato bruschetta is my interpretation of a classic combination – tomatoes, ricotta and basil. It’s a game changer. Roasting the tomatoes intensifies the natural sugars and renders them softened and candy-like. 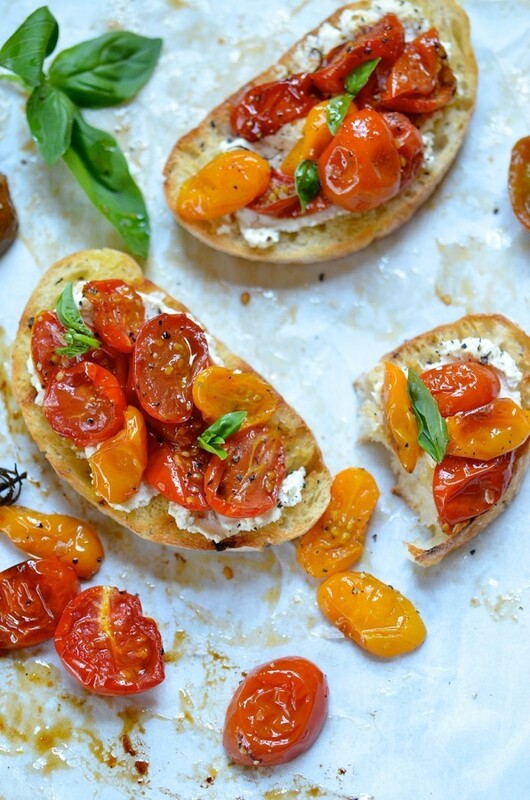 All this deliciousness is then piled onto hot bruschetta with ricotta and tangy goat’s cheese – summer on a plate. We’re all familiar with the old adage of necessity being the mother of invention and so, what I’d like to ‘invent’ is more time. If you’re like me, trying to steal minutes here and there, especially when it comes to preparing meals, then this deal is definitely for you. 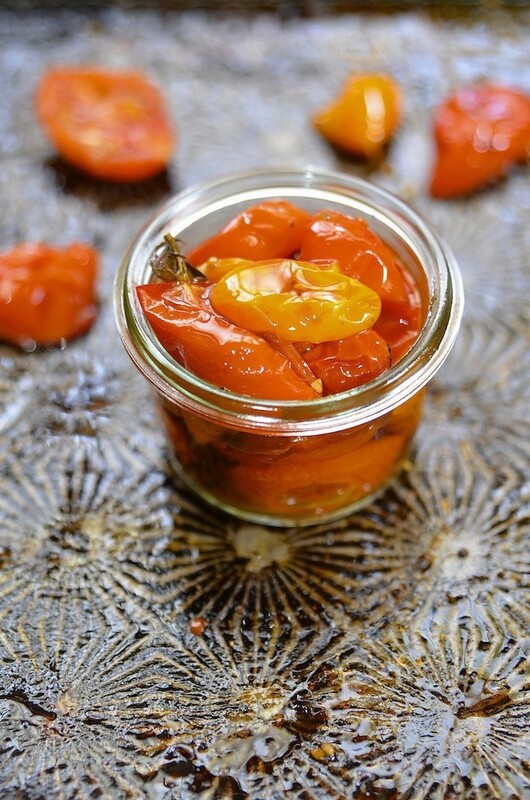 These roasted tomatoes can be adapted into a couple of super simple dinners. To make a simple Napoletana sauce, scrape all the tomatoes into a blender and blitz briefly. Toss the sauce through pasta and serve with fresh basil and parmesan. For a luxurious tomato soup, add 500ml hot chicken stock and one cup of cream. Blitz until smooth, heat through and serve with buttered crostini. It also makes a great omelette filling together with a handful of rocket and a generous crumbling of salty feta. A delicious, carb free breakfast. Preheat the oven to 190°Celsius. Line a baking sheet with parchment paper and spray with non-stick baking spray. Spread the tomatoes onto the sheet, drizzle with olive oil and balsamic vinegar. Scatter over the sugar, chilli, thyme, salt and pepper. Toss together and turn the tomatoes to face cut side up. Roast for 40-45 minutes or until the liquid is reduced. In the meanwhile, mix together the ricotta and goat’s cheese. Add a light drizzle of olive oil and season with salt and pepper. Slice the ciabatta and brush with olive oil. Toast on both sides, preferably in a griddle pan or in a hot oven until the bread is crisp and golden. If you lovvvvve garlic, rub a cut clove over the hot bread to get your flavour on! 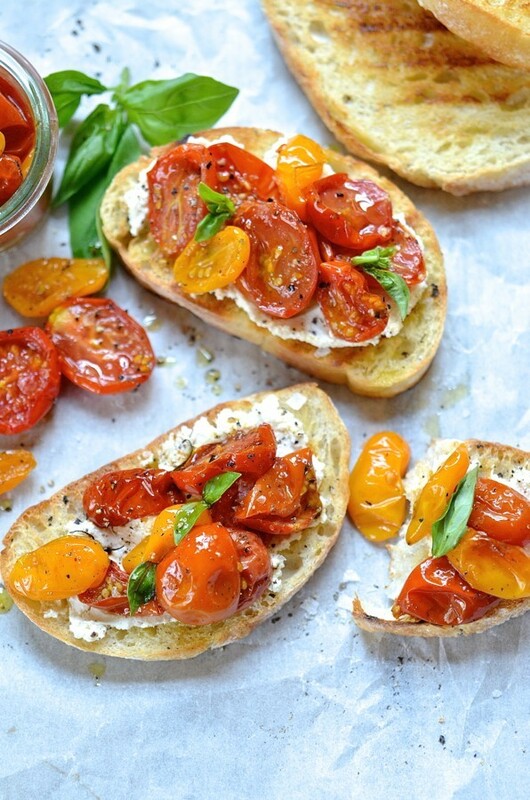 Spread a generous layer of cheese onto each bruschetta. Pile on the tomatoes and top with basil. Drizzle with a little extra virgin olive oil and freshly ground black pepper. Hope you’re going to try them this weekend! Ooooh……..looks divine Di. Light and refreshing for a hot summer’s day! Thanks Natelle. They’re great for a light and easy supper. Oh mamma Mia, my mouth is watering! Will make them for you next time round Gela. This was the first time I tried goat’s cheese, and it is simply irresistable. So glad you did, Ivette. After Christmas canapés, there’ll be another reason to have it again. Hi Di. Can you make the tomatoes the day before. I have a family function on Sunday. Sure you can. The tomatoes will keep well for several days, covered and stored in the refrigerator. You’re so welcome Conny. I must say, no matter how many times I serve this, even to the tomato averse sceptics, they always go down a treat. So glad your guests enjoyed them. Thanks so much for stopping in.